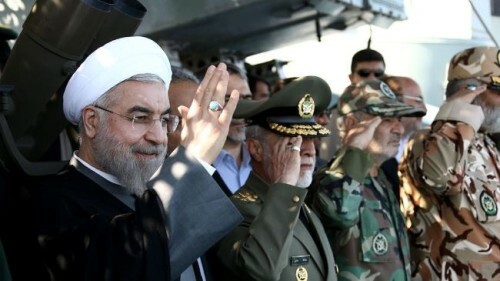 Greeting forces at the end of a major military exercise, President Rouhani has made the interesting claim that US-led sanctions have boosted the power of Iran’s military. God willing, and through unity and solidarity among the people, government, and Armed Forces, Iran will make progress every day in every aspect and no superpower will be able to dent our authority and independence. With Iran battling economic difficulties and struggling to fund the proposed Government budget, the Islamic Republic has staged one of the largest military displays in its history over the past week. It is very important for us and Iranian nation that Armed Forces showed off their capability and power in defending the country against the enemies. The readiness that they display of themselves in such maneuvers deters the enemy forever from [harboring] any whim against and coveting the land of Iran…. If some think they can bring this nation to its knees by exercising pressure, lowering oil prices, and planning and executing different plots, they are seriously mistaken. Iran and Turkey have implemented a preferential trade agreement, signed in January 2014, with Tehran hoping for a sharp increase in revenues. Iran;s Industry, Mining, and Trade Minister Mohammadreza Nematzadeh and Turkish Economy Minister Nihat Zeybekci endorsed the agreement for reduced tariffs on 125 Iranian goods and 140 Turkish items in a ceremony in Tehran on Wednesday. In 2013, Turkey exported $4 billion in goods to Iran and took about the same amount in imports. The Islamic Republic has set a goal of $15 billion in trade in 2014 and $30 billion in 2015. Iran has received another $490 million in frozen assets under a November 2013 interim nuclear deal with the 5+1 Powers. The Central Bank announced on Wednesday that the money was transferred to an Iranian account in Oman from South Korea. Under the Joint Plan of Agreement, which took effect in January 2014, Iran limited nuclear activities in return for the limited easing of US-led sanctions. In November, after failing to reach a comprehensive settlement, Iran and the 5+1 Powers agreed to another seven-month extension of the interim arrangements, with $4.2 billion in assets unfrozen by July 1.